Every year, the Da Vinci Schools work with local first responders to plan, prepare, and practice our responses to emergency situations, including earthquake, fire, and emergency lockdowns. Since moving into the new building, we have been working with our Student Resource Officers on these plans. 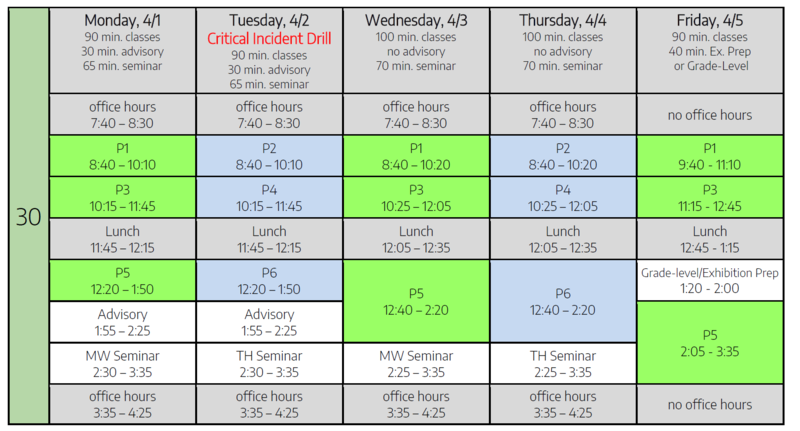 We have an emergency lockdown drill planned for the morning of Tuesday, April 2nd. Staff is trained for how to respond to such an event and prior to this drill, procedures for students will be reviewed with them. During the drill, students will have a chance to practice the proper response if such a crisis were to occur. Be advised that the reception desk will be temporary closed to visitors, parents, and students arriving during the time of the drill. No one will be allowed to enter or exit the building during the drill. If you have any questions regarding this drill, please do not hesitate contact the front office of your child’s school. Thank you for your support in maintaining the safety of our students, staff and schools. 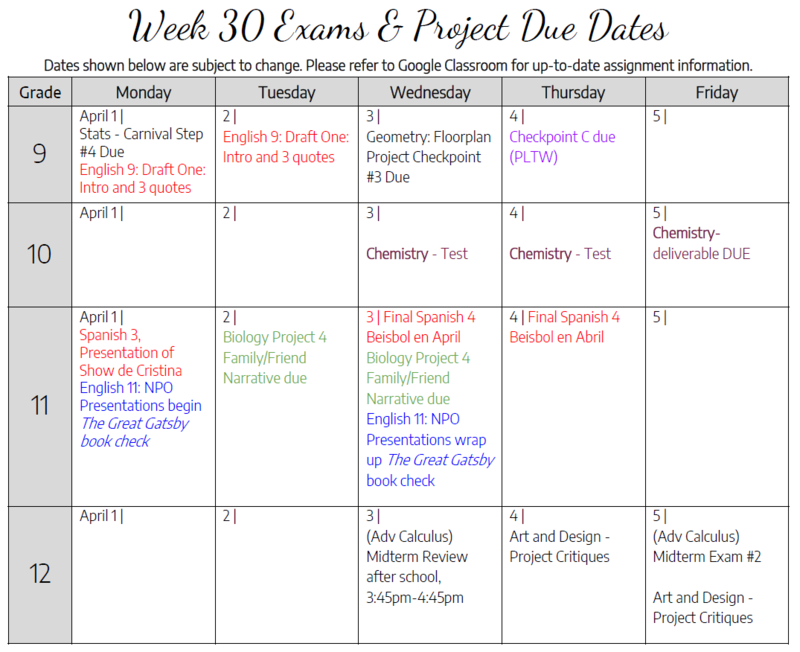 Here are the schedule & due dates for next week! This event is open to parents and family members. Just a reminder that there’s a different schedule for tomorrow to accommodate the various activities going on here at DVS. 11th graders who are taking the SAT are expected to be at school at 7:40am, and all 11th graders will be dismissed at 2:35pm. 9th graders will be taking the California Physical Fitness Test in the afternoon, so we are asking them to wear or bring athletic attire tomorrow. 12th graders will be taking a field trip to the beach. Please review the graphic and email Erin D’Souza (edsouza@davincischools.org) if you have any questions! Da Vinci is hosting a Spring SAT Course for its students (a $499 value) for only $99 per Student! Scholarships are available to students who are have free & reduced lunch. Please see Steve Wallis for details. All classes held on-campus at Da Vinci from 4:15pm to 5:45pm . Practice exams are Saturdays on campus from 8:00am to 1:00pm. Eligible sophomores and juniors who register for the April, June, or July 2019 test dates may enter to win in the ACT Scholarship Giveaway. During registration, check YES to opt-in to the ACT Scholarship Giveaway for your chance to win. Please view the attached flyer and receive more information here. 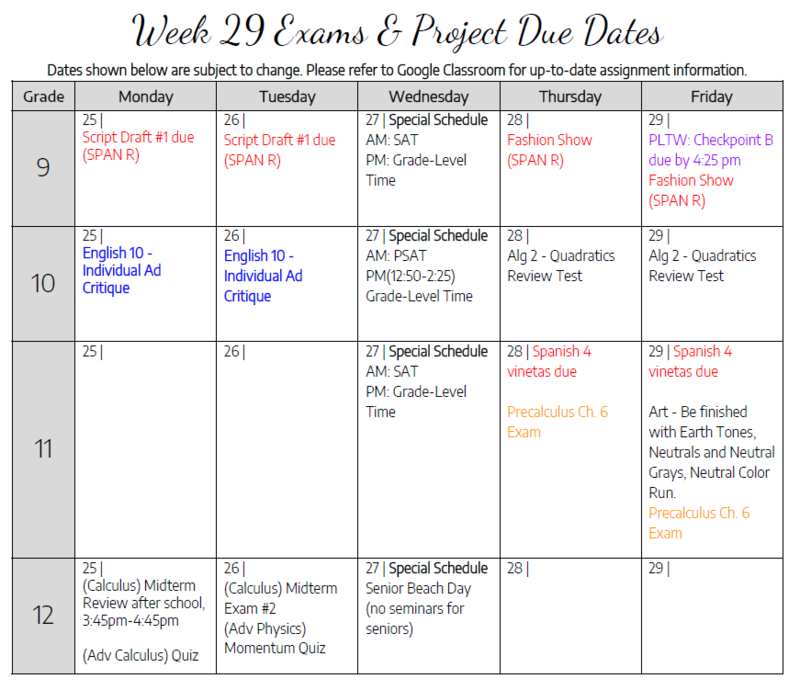 Here is the schedule and calendar of due dates for next week! Wednesday will be a very busy day, with alternative schedules for all students. 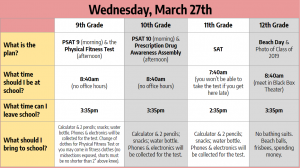 9th grade: In the morning, students will take the PSAT 9, a practice SAT exam designed for 9th grade students. In the afternoon, they will take the California Physical Fitness Test. If you have a 9th grader who cannot participate in the California Physical Fitness Test, please email Erin D’Souza (edsouza@davincischools.org). 10th grade: In the morning, students will take the PSAT 10, a practice SAT exam designed for 10th grade students. In the afternoon, they will be watching a Prescription Drug Awareness Assembly presented by CVS Pharmacy. 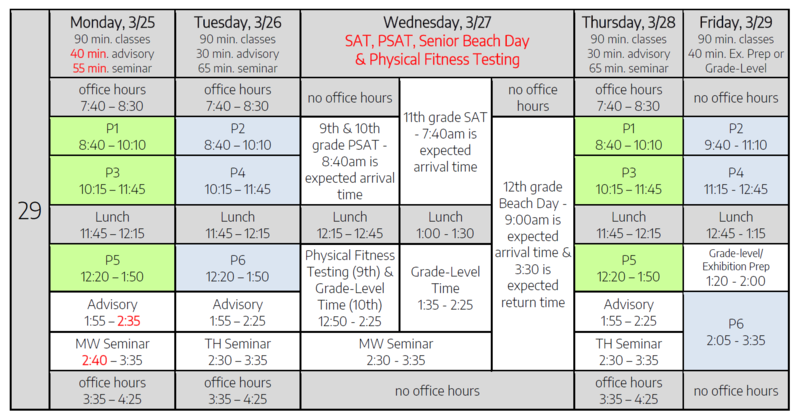 11th grade: Juniors will take the SAT exam in the morning, and must arrive by 7:40am. In the afternoon, they will begin preparations for Exhibition Night on Thursday, April 11th. 12th grade: Seniors will have their annual Beach Day & class photo. Parents of 12th grade students: DV Extension will be hosting a third family information night on March 28th at 6pm at the 201 campus in the Multi-Purpose Room. Come join us to for an information presentation and Q & A time. if you are considering DVX as one of your college options, please feel free to fill out this form. A DVX staff member will contact you to answer questions and discuss how the program fits your educational and career goals. Once you submit the application, a DVX staff member will contact you to set up an in-person meeting. Parents and students of the 10th grade, please join us for your 10th grade College Planning Meeting on Wednesday, April 3rd at 5:00 pm in the Black Box Theater! Please join us for an informational meeting regarding what students and parents can do to prepare for college. This informational meeting will be held in English, but if you and your family would like to receive this information in Spanish, we encourage you to connect with your respective counselor. No sign-up is necessary and we look forward to seeing you there! Da Vinci Schools is hosting a Career Day on Tuesday, May 7, 2019 from 10:30am to 12:30pm and we need your help. We are looking for up to 50 panel speakers to share their careers and work experiences with Da Vinci students. This is a great opportunity to expose our students to a variety of careers. If you are interested in volunteering as a speaker, please visit the sign up by April 15.